High intensity training builds muscle and maximizes lactate build up. Caffeine helps you to train at maximal intensities. Correct, but there appears to be a more direct link between lactate accumulation, caffeine supplementation and skeletal muscle hypertrophy. No, you are not mistaken: The headline says and means that caffeine and lactate are powerful agents that may promote skeletal muscle hypertrophy by boosting satellite cell activity and anabolic signalling in favor of muscle hypertrophy. After a thorough review of the existing literature discussing the individual effects of caffeine and lactate on skeletal muscle metabolism and anabolism, Yoshimi Oishi and colleagues from the Ritsumeikan University hypothesized that "a lactate-based supplement containing caffeine, an activator of intracellular calcium signals, could elicit proliferation and differentiation of satellite cells, activate anabolic signals in skeletal muscle, and thereby increase muscle mass when combined with low-intensity exercise training." 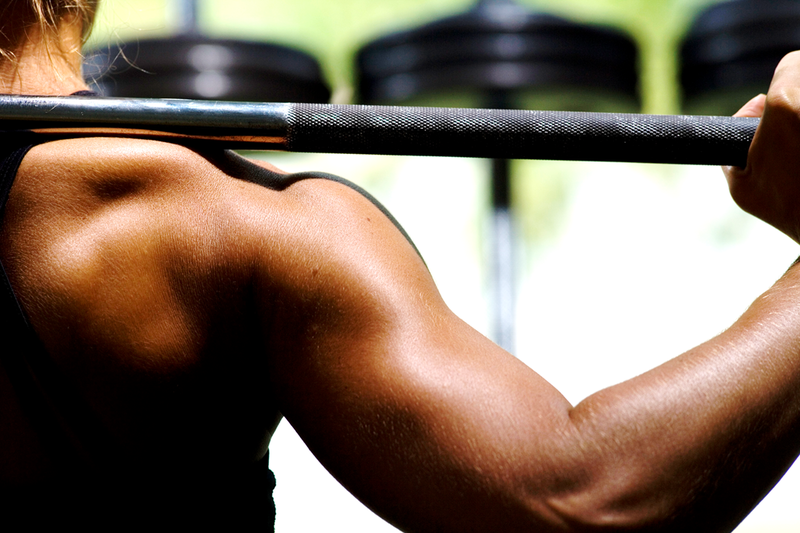 Are you looking for other muscle building tips? Tri- or Multi-Set Training for Body Recomp.? Alternating Squat & Blood Pressure - Productive? Now, this raises the question how calcium comes into play. According to Oishi et al. its beneficial effects are related the ability of caffeine supplements to increase the amount of intracellular calcium (Lu. 2007), which activates calcineurin, which will in turn induce slow and fast fiber hypertrophy (Talmadge. 2008) - unfortunately, this effect appears to favor type I (=endurance fiber) over type II hypetrophy, but this may well depend on the trigger that's used, i.e. endurance training as it was the case in a rodent study by Talmadge et al. or your strength workouts. Figure 1: Graphical illustration of the mechanism by which caffeine and lactate may increase your gains. Too complicated? Well, check out my graphical summary in Figure 1. 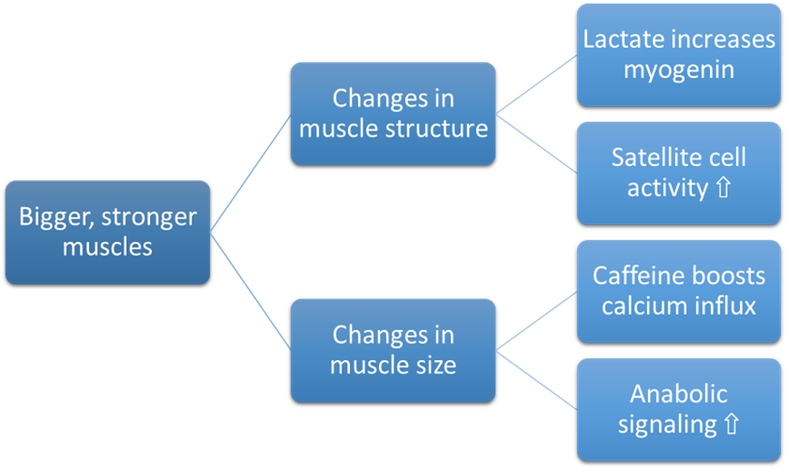 I guess this should explain the basic mechanism: Lactate up = increase satellite cell proliferation = hotbed for muscle hypertrophy + calcium up = increased calcineurin = trigger for increased hypertrophy. High intensity = high lactate, high intensity + bicarbonate = even higher lactate: The study at hand used lactate + caffeine supplementation and low intensity exercise. With high intensity exercise the increase the usefulness of additional lactate supplements may be significantly reduced, because higher intensity equals higher lactate accumulation anyway. As a previously discussed study on high intensity high volume leg training indicates, this effect can be augmented by sodium bicarbonate supplementation which allows for increased lactate levels in the absence of the debilitating effects of skeletal muscle acidosis (read more). In the study at hand, the researchers quantified the effects on skeletal muscle hypertrophy by weighing the gastrocnemius and tibialis muscle of the rodents after 4 weeks of treadmill training and the effects on muscle restructuring via incorporation of new muscle nuclei (learn more) by measuring the increase in DNA content from exercise training alone and exercise training in conjunction with lactate + caffeine supplementation. Figure 2: Exercise and exercise + supplementation induced changes in muscle weight and DNA content of skeletal muscle in mice exposed to four weeks of low intensity treadmill running (Oishi. 2015). As the data in Figure 2 indicates, both muscle hypertrophy and the exercise induced increase in satellite cell activity were further augmented by the addition of lactate and caffeine in dosages of 1g/kg sodium-lactate and 36mg/kg caffeine. In conjunction with the likewise observed increases in myogenin and follistatin expression of the fast twitch (that's what you use for lifting weights) gastrocnemius muscle relative to the exercise alone, the results of the study at hand clearly warrant the scientists conclusion that the administration of sodium lactate and caffeine "can effectively increase muscle mass concomitant with elevated numbers of myonuclei, even with low-intensity exercise training, via activated satellite cells and anabolicsignals" (Oishi. 2015). So, what does this mean in practice? Assuming the same effects would occur in human beings the effective dosages of sodium lactate and caffeine would be 81mg/kg and 2.9mg/kg, respectively. Practically speaking you would have to take ~6.5g of sodium lactate and 232mg of caffeine. That's quite a reasonable amount and should not have nasty side effects. Whether the sodium lactate offers additional benefits to trainees who work out far beyond the lactate threshold (remember: the rodents did only "light exercise"), remains questionable. The same goes for the question whether the addition of sodium bicarbonate would elicit similar beneficial effects on the lactate induced increase in satellite activity. In view of the fact that previous studies show that it does potentiate the beneficial effects on another albeit not directly related marker of mitochondrial changes in muscle structure, namely PGC-alpha (see previous SuppVersity article), I personally believe this would be worth investigating | Comment on Facebook! Brooks, George A. "Cell–cell and intracellular lactate shuttles." The Journal of physiology 587.23 (2009): 5591-5600. Hashimoto, Takeshi, et al. "Lactate sensitive transcription factor network in L6 cells: activation of MCT1 and mitochondrial biogenesis." The FASEB Journal 21.10 (2007): 2602-2612. Lu, Ying-Mei, et al. "Imbalance between CaM kinase II and calcineurin activities impairs caffeine-induced calcium release in hypertrophic cardiomyocytes." Biochemical pharmacology 74.12 (2007): 1727-1737. Oishi, Yoshimi, et al. "Mixed lactate and caffeine compound increases satellite cell activity and anabolic signals for muscle hypertrophy." Journal of Applied Physiology (2015): jap-00054. Talmadge, Robert J., et al. "Calcineurin activation influences muscle phenotype in a muscle-specific fashion." BMC cell biology 5.1 (2004): 28.